I was delighted to work with Vicki in supporting Teacher Candidates in their P/J Math learning. The students were excited to access her math content knowledge and strategies which she shares in ways that are accessible to all learners. Thanks to co-planning and co-teaching with Vicki, my classes benefited from engaging lessons – and a genuine model of collaboration. She integrated the use of Children’s Literature and various manipulatives, particularly relational rods which many had not used before, to bring the teaching and learning of Mathematics to life. Excited to invite her in again! I have known and worked with Vicki for over ten years. She has co-taught in my classroom as a Special Assignment Teacher and later volunteered in my classroom on a weekly basis. 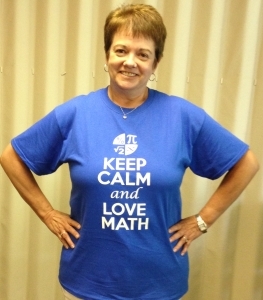 I regularly read her blog and value her opinion on all matters related to teaching math. She is an excellent teacher from whom I have learned a great deal. She is interested in collecting practical data with regards to student learning and using it to drive instruction in common sense ways. She is innovative and believes in flexible thinking in mathematics to solve problems, but also understands the benefits of more traditional practices and the realities of a diverse classroom of learners. She is gifted at questioning during the consolidation of math activities/problems and always seems to be able to guide students to the achievement of learning goals by asking simple but thoughtful questions. For these reasons, I don’t hesitate to say that she has helped me become a better educator and has been a very positive influence on my overall practice as a math teacher. I was taking Primary/Junior Math Part 1 in July 2017. Vicki McGinn helped me to create a 3-part lesson plan based on a choice of a few particular areas of mathematics that are often challenging concepts for students to grasp. I chose to focus on a grade 1 class. It was also my final task and I was expected to incorporate all that I had learned so far. Vicki and I met and went through several resources to find ideas. We decided on fractions because it is an area that I wanted to investigate further. Vicki helped me decide on a big idea and learning goal for this 3-part lesson plan. She is familiar with many resources and showed me various examples of activities that we could adjust and modify to meed the needs of grade 1 students. There were many parts to put together for the 3-part lesson plan and Vicki was very helpful in strengthening my ideas with great connections to the math curriculum as well as other curriculum areas. She was able to guide and redirect me to make sure that my learning goal was still the main focus of the activity. Vicki posed questions to me that helped me gather questions for the students before,during, and after their activities. She guided me through this learning process and I am so grateful for her assistance. Vicki’s Math Motivator website is an excellent source of activities, information, resources, books, learning, thinking, and experiences. I find it very helpful in all areas of mathematics. From the day we first met in 2004, I have known Vicki to be a reflective educator celebrating “learning something each time there’s opportunity to be in a classroom with students Mathematical thinking.”. To be in a thinking space with Vicki McGinn is to be an active co-learner. As experienced by her students, colleagues, friends and family, Vicki thoughtfully learns from and learns with, the mathematical insights and experiences of young people and adults alike. The opportunity to participate in this learning experience through her Math Motivator blog is truly an invitation to join in, and be part of a rich thinking and learning journey. Within this blog are Vicki’s accounts of these moments in time, alongside patterns of learning over time-informed by her own classroom observations, incorporated with consideration of respected researchers’ perspectives and experiences. Thank you, Vicki for sharing your reflective practice, sense of humour and sincere joy in math learning and thinking! It is a privilege to learn from and with you always.